The unbelievably gorgeous Milford sound – which is located in the northern section of the Fiordland National Park on New Zealand’s South Island – causes even the worldliest traveller to catch their breath when they first encounter this area. A calm, still fiord surrounded by towering cliffs and lush rainforest, this area is akin to Heaven on Earth! The Māori people frequented Milford Sound, making the seasonal trek from the east in order to collect precious pounamu (greenstone). According to the Māori, Tu-te-raki-whanoa, an atua (godly figure), was responsible for carving out the distinct shape of the fiord. Using his toki (an adze) called Te Hamo; he chanted a powerful karakia (type of prayer) as he hacked away at the mountains. The Māori called this area Piopiotahi – referencing a single thrush-like piopio bird, which is now unfortunately extinct. Their name has deeper meaning though, and is based on the legend of the cultural hero, Māui, and his battles for the immortality of humankind. Māui unfortunately died in his attempt, but a beautiful piopio flew around Milford Sound in mourning of the lost hero. Europeans first saw Milford Sound when Captain John Grono discovered it in 1812. Grono named the area Milford Haven, in honour of his Welsh homeland, but Captain John Lort Stokes renamed it Milford Sound in later years. The Fiordland area quickly became popular with whalers and sealers, thanks to Captain James Cook’s description of the area when he visited Fiordland (but not Milford Sound) in 1773. These whalers and sealers, along with surveyors, explorers, prospectors and their families made up the first settlers in the area. There are less than 200 people living in Milford Sound today though. Geologically, Milford Sound is actually a fiord, rather than a sound. This is because it is formed from the erosive effects of a glacier, in a process creating what is called a fiord, rather than formed by the sea, which is the case with landforms called sounds. The fiord is as deep as 400 metres in some areas and its highest pinnacle is Mitre Peak on the fiords south shore, which rises to a dizzyingly steep 1,692 metres. Mitre Peak is so named because of its peak’s resemblance to the shape of a bishop’s mitre and interestingly, the peak is actually made up of five tight-knit peaks. Today, Milford Sound is the most recognised fiord in New Zealand and the only one accessible by car. Because of the short distance (16km) between the head of the fiord and the ocean, it’s easy to travel the entire length of the fiord to open sea and then back again, making Milford Sound a great place to visit on a cruise or kayak. Milford Sound is by far the best known of all of the fiords and the only one that can be accessed by road. It is approximately 16km from the head of the fiord to the open sea, which means visitors can comfortably travel the length of the fiord to open ocean and return on one of the many cruise options available in 1½ to 2 hours cruising time. 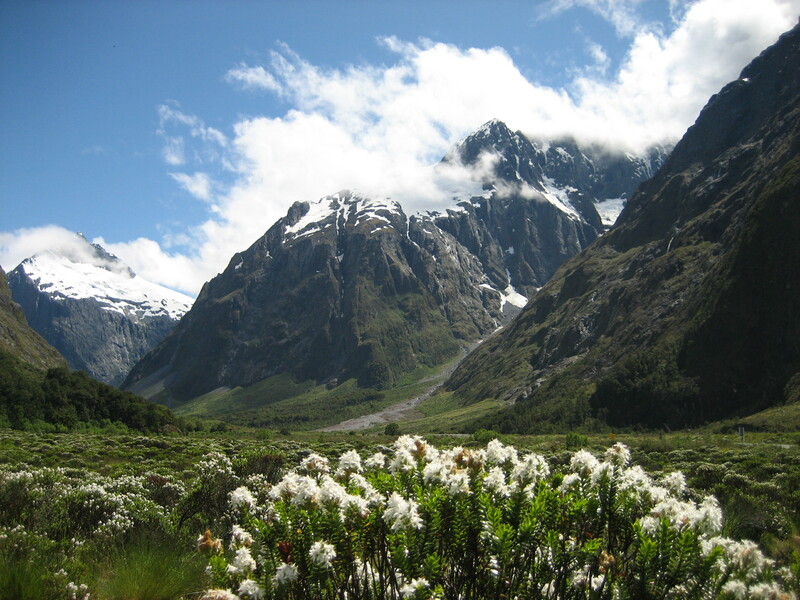 The flora and fauna of Milford Sound is also one of the area’s primary drawcards. The steep faces of the cliffs surrounding Milford Sound are clad with deep emerald coloured beech rainforest, moss and ferns, offering food and shelter to local wildlife. The snowy areas closer to the peaks offer a variety of herbs and flowers for animals to graze on. The wildlife supported by this vegetation includes several threatened native species, including the flightless bird that was once assumed to be extinct – the Takahe. The in traduced (and damaging) species include rats, mice, hares stoats, possum and deer. The South Island Saddleback and rare Fiordland Skinks have been made relatively safe since the eradication of the introduced Norway rat. Forest birds such as Tomtits, Grey Warblers, Brown Creepers, Tui, Fantails, Bellbirds, kea and Woodpigeons are found throughout the fiord, some of which rely on the sea life to sustain themselves. Under the water, there is an entire paradise unto itself. The clear, calm and surprisingly warm water is home to beautiful corals (such as the rare red and black corals), sponges and sub-tropical, cool water and deep water fish, which usually are seen at lower depths, but are closer to the surface within the fiord due to a layer of tannins from the forest creating unique conditions. The world’s largest population of black coral trees – some around 200 years’ old – as well as clam-like brachiopods also call Milford Sound their home. Of course, most people come to see the stars of the region – the inquisitive and extremely cute New Zealand fur seals, Bottlenose dolphins, Fiordland Crested Penguins and little penguins who reside in the area. Whatever reason you have for wanting to visit this stunning area, we have the tour that’s perfect for you!